Observed Strategic Tendencies: Siege Warfare, Combined Arms Tactics, Ship-borne Assaults and Boarding Actions, Intelligence Operations, Defensive and Fortification Operations in Extremis. "The XVIIIth? Do not speak to me of those deplorable Tinmen, they have no honour, no warrior spirit amongst any of them, Nomus may as well rule a Legion of Servitors." ~Hectarion Mycenor, Primarch of the Crimson Lions. ~Nomus Sardauk, Primarch of the Steel Legion. 'Nomus' crashed onto a planet ruled over by a powerful Dark Age AI known as the Overseer. The population had been split into two classes: one who lived in luxury in floating cities tightly governed by the Overseer and his mechanical guards; the other who lived a relatively primitive existence amongst the decaying ruins of the rest of their civilisation. It was only later that 'Nomus' would acquire that name, for he crashed into the domain of the Overseer who classified him according to the system it used: ðμþ-13768230/Ω. Via genetic sampling the Overseer was able to comprehend the greatness inherent in the child Primarch and thus embarked upon a series of cybernetic enhancements greater in scope than any it had bestowed on the inhabitants of the planet. In order to facilitate this program 'Nomus' was kept under heavy sedation and existed in a dream-like state provided by the Overseer. The enhancements given allowed 'Nomus' to interface with the systems of the floating cities mentally and interact with it directly. Naturally the Primarch's mind was the perfect tool for such a system and he learned at a prodigious rate. Eventually he discovered he was able to subvert the Overseer's commands and hide things from the ruling AI. The discovery that he was in fact greater than the one that lead him pushed him to create the coup that would destroy the AI and take his place as ruler of the floating cities. It was the members of this rebellion who named him Nomus Sardauk after a great figure from their history, and it was by this name he was known through the Imperium after his rediscovery. Nomus is an average sized Primarch, which is to say he is as a god among lesser beings, but it is not his physical prowess that makes his dangerous. It is his mind, enhanced beyond any hope to comprehend that is his true weapon. Every iota of information that he uncovers or is taught is stored and categorised for instant access at any moment. He never forgets anything and can perfectly recall and describe details from a conversation centuries ago as if he were experiencing them. However it is not only his experiences that he has access to. Since his rediscovery he has taken to scouring every database and store of information that he can in the Imperium in order to know everything. However Nomus doesn't merely iterate on existing technology or tactics. He is still a Primarch and he often uses his prodigous intelect to come up with new technologies and innovations. He is said to have been heavily involved in the development of the Tartaros pattern of Terminator armour, providing some unique insights on how to increase mobility without lowering integrity. On the battlefield he takes in everything, monitoring the sensory input of every single marine, servitor and machine spirit. Through this he knows of the movements of the enemy as they happen, or even before they happen if the enemy is using a tactic that Nomus has knowledge of. The units under his command flow seemlessly around and through one another in an inticate pattern designed to blunt enemy offensives or open their strongholds in the most efficient manner possible. I am the Sum of all parts. I am the Eighteenth Legion. The XVIIIth tactics rely on a complex interplay of units of different specialisations acting in perfect concert to achieve their goals. However, one thing that is almost always a factor is the use of preliminary bombardments, either saturation or precision depending on the situation, to suppress and kill the enemy without risk to the Sons themselves. As such they have heavy artillery and naval elements allowing them to strike at some foes with impunity. Where such bombardments would prove ineffective the XVIIIth will engage on the ground. Here they do not focus on a single aspect of fighting, but use each unit to cover the weaknesses and blind spots of the others. Most marines show a greater propensity for ranged warfare, however whether this is due to some preference passed down via their cybernetic links or simple expediency is unknown. Due to their ability to analyse their enemies quickly and accurately, fixed emplacements are especially vulnerable to the XVIIIth Legion, because they cannot adapt or change so breaking them is a simple task of applying sufficient force to weaknesses until they crack. The XVIIIth also specialise in the mixing of fleet and ground operations, their ships being in the precise place they need to fire lances or macrocannon shells into concentrations of the enemy. There is also an incredibly high incidence of cybernetic augmentation within the XVIIIth Legion. All Legionaries have some allowing access to a collective neural network allowing for instantaneous transfer of information during battle without that unnecessary speaking part. Others go further in an attempt to emulate their Primarch allowing them to act as nodes for their brothers, holding vast stores of knowledge on tactics or weapons for faster access when fighting. They have close ties to the Mechanicum, but both sides hold some things back from the other. The Mechanicum because it doesn't want to give away all its secrets, the XVIIIth because the Tech Priests haven't risen beyond human emotion (jealousy anyone?) enough for them to be trusted with some things. The Imperial Army generally finds the marines of the XVIIIth eerie with their implants and their lack of talking. But on the other hand their survival chances are usually higher when fighting under one as a commander, so they will do so. For their brother marines it's a bit of a mixed bag. They don't really like being put under the command of others as they can see the strategic tendencies of those Legions getting in the way of efficient victories. They also find it limiting to have to verbalise inter-squad communications so that the others can follow what is going on and adapt to the changing circumstances. Having said that I think there would be something close to friendship between the XVIIIth and the Fire Keepers and the Iron Bears. All of them are technologically minded and Niklaas and Daer'dd would recognise, and appreciate, Nomus' abilities as an inventor in a way that the others wouldn't. Alexandros and Nomus would likely share a healthy respect, they are both very different but have formidable skills in the ways of war. Raktra on the other hand would probably dislike/outright hate Nomus and his sons as they eschew his preferred methods and don't always get their hands dirty. The Wardens and Crimson Lions would probably be standoffish with the XVIIIth as they have a strong sense of personal honour and improvement which is at odds with the XVIIIth and their collectiveness. The Warriors of Peace would likely be on good terms with the XVIIIth as both have strong cohesiveness in the legions and a greater than the sum of its parts ethos. Not too certain on the rest off-hand, but they will be worked on. In the early Insurrection they are sent to counter the fleets of the Void Eagles as they are the only naval force of comparable strength fighting for the Stormborn. Later on the join with the Suzerainty as they have discovered that their augmentation is limited by their biology. So in order to better emulate their Primarch (and for him to improve further) they need to join with the ones working on the genetic manipulation and improvement of Astartes. The Legion is heavily technologically aspected. But where others would be about physical enhancements primarily, the XVIIIth improve their minds. Every marines is part of a collective; sensation, information and even experience can be shared between members. As a marine falls his consciousness is disseminated through this link so that the experience is not lost and as more marines in a unit fall the remainder become more an more effective. Eventually too few, or only a single marine is left. A single marine is given command of a new initiated squad so they can benefit from is experience. Units that have been whittled away and are too small for effective battlefield use are amalgamated with other likewise reduced units. Eventually over several repetitions of this process come out veteran marines who have the combined knowledge and experience of dozens and effectively have skills honed over hundreds or even thousands of battles. The XVIIIth would see this as an opportunity to better themselves. 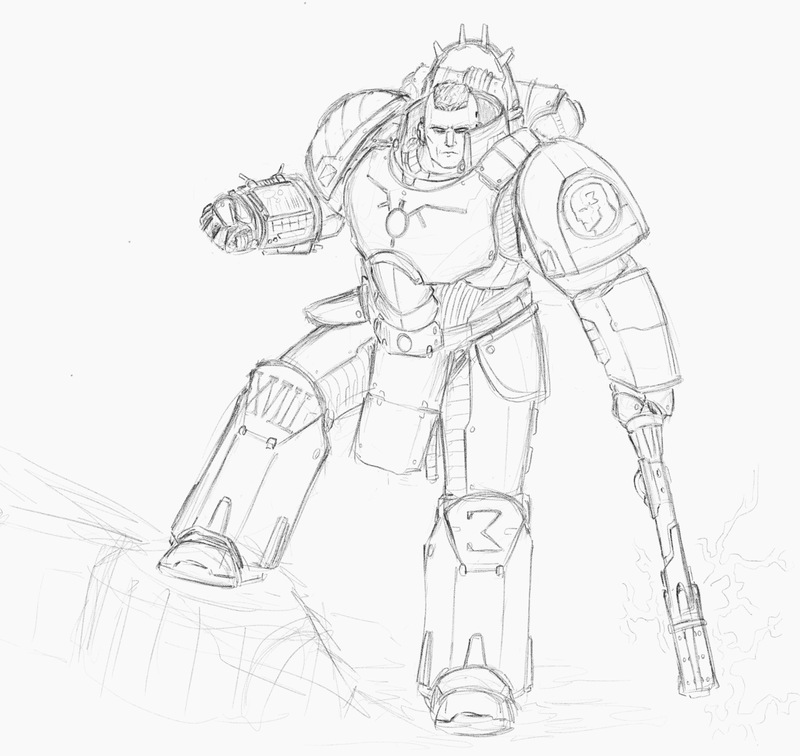 They would send more marines out into the other branches of the Imperium, such as the Mechanicus I order to draw in even more knowledge. Eventually they would become the ultimate Lore Keepers possessing all the skills and knowledge of a combined humanity. Both the Preomnor and Omophagea act at a diminished capacity within the XVIIIth and they are able to only gain extremely limited information through consuming a foe's flesh, also they are slightly more susceptible to poisonous substances than other marines. However their Sus-an Membrane seems to be highly responsive allowing even the most critically injured marines to survive the vital moments for their memories to be uploaded to the collective. Okie-dokie folks, welcome one and all to the dedicated development thread for our new XVIIIth Legion, the cyberpunk-inspired Steel Legion! Me, Grifftober and Kelborn will be here working to further refine our initial concept and fit it into the greater Brotherhood of the Lost and we heartily welcome any and all comments, criticism and suggestions, so feel free to leave your thoughts for us to read. Edited by Lord Thørn, 28 November 2017 - 09:38 PM. Ahhh. Now the real thing. So as your legion theme is about the enhancements of the mind and mind focus# how about a creature which liked to give riddles or stands for big intelligence like a fox, an owl or mkre about the mystic: a sphinx? I like the concept! I was worried that they would be Iron Hands 2.0 but I like how you've put a fresh spin on their close ties to the Mechanicus and heavy use of bionics. EDIT: for a name...Iron Claws? Iron Ravens(in Norse culture the raven was a wise animal)? Edited by Sigismund229, 06 November 2016 - 07:02 PM. Perhaps the most critical question I have right now is that will the legion take the Jackel's slot in Book 2? I think it'd work fairly well with Nomus in charge of keeping Azus captive, while the emphasis on mechanized artillery forces provide an interesting contrast to the Dune Serpents' BOW ninja strikes. Plus, if the 18th does hit the Void Eagles, it turns them into natural rivals as the Void Eagles are also in Book 2. Silver Seraphs? Since seraphs are the highest form of angel, it could hint toward their desire to mentally elevate and enhance themselves above others, and advance human progress. Also a six-winged motif could make for an awesome symbol, as well as tying into the Vitruvian icon of the Suzerainty. Here's the thing about our naming choices, we were trying to avoid the more superstitious, animal totem naming themes of other legions and go for something more modern-sounding, Silver Scorpions was only ever intended to be a placeholder name for the Election and because Kel suggested the Brotherhood of Nod as something we could use for inspiration regarding the Legion's culture, we were also trying to avoid religious sounding stuff and using "base" metals, especially Iron, for obvious reasons. Ha, while that might have been nice I didn't want to just throw in a reference that had nothing to do with the Primarch and Legion, sorry. As for the Sphinx, Fox or Owl thing, again we were trying to avoid animals as such a thing might be considered barbaric by our Legion. Thank you brother, that's very vindicating to hear as it was something we strongly sought to avoid, and I'm sure I speak for all of us (me, Kel and Griff) when I say that we'd welcome any lore or story offering from yourself, so thank you very much. As I said to Mikhal, we were trying to avoid "primitive" sounding terms like Claws or Ravens, thank you though. Hmm... Interesting, thank you again Sig, I'll talk about it with Kel & Griff. "I may be but small, but I will die a colossus." Aww, cheers Raktra! I knew behind all those skulls and blood you were really just a big softie. AND don't forget their warcry: "One vision, one purpose!" Edited by Kelborn, 06 November 2016 - 08:05 PM. Immortal Brotherhood sounds great, even without going with the RTS sources. They are the closest of brothers among the legions, being linked together by their very minds. And that link makes them, in a way, immortal, as the minds of the dead stay in the collective consciousness. Though I'm not sure why such a legion would use a warcry. As for a color scheme, I'm envisioning them silver and light blue, but that might clash with the Apostles of War. Another idea would be dark grey and either red/blue/green, the quitessential cyberpunk colors in my mind. Immortal Brotherhood of Steel Marines? That's what I as well had in mind when that name popped up. This "warcry" can rather be used as a theme or a greeting or a phrase used before a battle, you know? I believe dark grey and blue are the colors of the Genesis Legion...but I definitely think we need a blue colored legion. I'd say Immortal Brothers before Brotherhood. A good test for a name, I've found, is to put "Legion" at the end and see if it sounds right. Immortal Brotherhood Legion just sounds redundant. I'm not at my laptop but at least I can say that we thought about chrome and dark silver / grey colors as well. But you'll see when either Griff or Sangi are back and provide our possible color schemes. But dark grey blue us close to apostles. How about silver only? And how about legion of immortal brotherhood? Masters of the mind? Spirit Masters? Mind Benders? Edited by MikhalLeNoir, 06 November 2016 - 09:03 PM. Yeah, should have clarified. In Christianity they are regarded as the highest order, but not in Judaism. On the colour scheme. We were thinking a clean silver chrome as the main colour with circuitry-like patterning. For the accent colour we weren't entirely decided, I believe Sang suggested black as it goes with everything. I've been trying a few variations out in the Chapter Generator (I would upload images, but photobucket is being a pita), the one I've been liking the most is a Khorne Red colour for the shoulder pads. However the silver colour does go with almost anything so I think we could almost pick any colour and it would look good. I'll put some stuff up when photobucket starts cooperating (probably tomorrow sometime). I'll also try looking at the schemes with the other Legions so we don't overlap to much. Silver red could be cool. Or grey red. Food for thought: We have only one legion that incorporates blue In the color scheme. As for red: we have four. Thus, the Immortal Brothers rise from (how about Corrin or Ix for a Dune reference) to unify mankind and let it achieve epiphany. Edited by Kelborn, 06 November 2016 - 10:47 PM. EDIT: thorn, if you insist on posting, read the other posts first thoroughly... I don't know, what will we do with you. How are servitors, robots and ai seen in the legion? Would they have more or less techmarines and praevians? Any ideas of units and wargear? Griff's character seemed interesting, any more ideas for what could be quite an impersonal legion? Edited by Lord Thørn, 06 November 2016 - 10:50 PM. I think we spoke about giving them advanced las tech weaponry like we discussed it for the suzerainty. They could be the source of it. I also had the idea of a drawback including a fluid which boosts their mental capabilities. During battle they don't have the time to consume it, resulting in reduced abilities. The longer a game goes, the heavier the drawback. To counter this, they make use of heavy artillery strikes and precise assaults like already mentioned to end a fight quicker. Rule wise: with every round they get a slight disadvantage. They can be equipped with an item which sets back the drawback once in an entire game. But as I'm neither a gamer nor a rule expert, this can be nonsense as well. I am at the moment in the process of writing a short story about the XVIIIth but I have a question: Do they have a general naming scheme? Good question, which, unfortunately, I can't answer. We haven't talked about that for now. As my main inspirations came from Dune, the Protoss and the Brotherhood of Nod, I would suggest something like them, mostly like the Protoss' names but this has yet to be decided. Guys, what did you have in mind for a general naming scheme? Edited by Kelborn, 06 November 2016 - 11:27 PM. Hammer And Anvil AM lists, Ideas, Help?